The First Echo: 'Clue' Turns 30: Let's Celebrate With Some GIFs, Shall We? 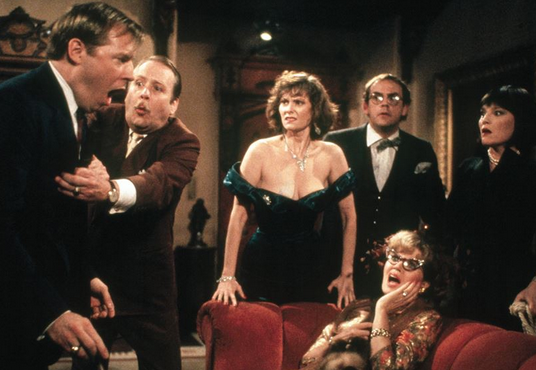 'Clue' Turns 30: Let's Celebrate With Some GIFs, Shall We? Clue, the 1985 movie adaptation of the popular murder-mystery board game (written by John Landis) that sparked a humongous cult following, is celebrating a humongous anniversary this year. And yours truly, who has attended several midnight screenings of the film and watched it dozens of times on VHS, DVD, and Netflix, plans to celebrate alongside all of the quote-spouting die-hards who are just as obsessive as I am. I literally can't right now. ...and educated me on the importance of a good, well-placed pun. If anyone tells you otherwise or tries to convince you that this movie isn't worth a mere 90 minutes of your precious time, do not listen to them. ...and get in on the fun, won't you?